That's my new word melding morning, afternoon, and evening. You know, because it's all kinds of different times of the day around the world when you read this. It might even be night, in which case you should be sleeping. Like a lot of you, I have a challenge list as long as your leg that I want to play in each week and only so many days in said week. But then every once in a while a challenge will enter your visersphere and you'll not be able to get it out of your head, no matter what else you have goinon. I adore that sediment font. It's from SU "Word Play." The blossoms are both NBUS. They are from Memory Box. The big one is "Prized Chrysanthemum Outline" and the small one is a double bloom made from one of the flowers in the "Glorious Gerber Daises" and one of the flowers in the "Fancy Potted Flower." The tiny flower embellie and flower centers are from SU. The double framed white PTI card was die-cut with "Stitched Rectangles" from Lil' Inkers. All that white space, that headboard, the beautiful starfruit color. Yummo. But, okay, there's just, if I can just ask you, is it just me and the hamster, or do you want to flip those pillows on the right side of the bed so that the room is more balanced? Coz me and the hamster were sitting here drooling over the photo and then I glanced over at him and his head was cocked over his left shoulder as if the room were leaning and then later he looked over at me and I was doing the same thing. And Hammy wouldn't mind a matching nightstand on the right, too, please. Don't get us wrong, it's still gorge and it inspired me to make one of my favorite cards. The Cutting Edge, where the amazing Kay Miller is our Muse inspiration. Simply Create Too, where the theme is "Monochromatic." Pixie's Snippets Playground, where the brief is simply to use snippets or scraps. To join in the fun and find out the details on rules, sponsors, and prizes, just click on the links. I'd love for you to meet new friend Patti Corrier of What Are You Inking? (Love the name!) Patti has been blogging since 2010. She is an Independent Stampin' Up demonstrator and her card art is always bright and exceptionally executed. You'll find oodles of design ideas when you visit! Thank you for joining, Patti, and welcome to the Playhouse! They do love that Washi tape! You're righton about the inspiration piece...seems HEAVY on the left... clearly needs you as designer. But, didn't you fix that right up with your card. That MUM is MUMerable(sorry, got a little ahead of myself, there). Love this Darnell! You chose just the right dies for this challenge! You captured the edges of the bed too with your cut off petals on the left and right upper corner and even the stitching! The little embellishment is a match too ;). One of my favourite cards of yours too! My Lil Inkers stitched dies are arriving this afternoon...I finally caught them in stock! It's always a pleasure visiting your blog. I always leave smiling. What a gorgeous interpretation of the inspiration picture!Beautifully CAS and happy card. I love that font too, love the way 'the' is cozily nestled in 'G'. So glad to see two precious and very, very creative cards from your grand sons. Hope all is well now. That's a stunning card Darnell and a perfect take on the inspirational photo. So glad you make the challenge. Good Moftering to you too! I know what you mean about the inspiration photo - it is absolutely gorgeous and I have been itching to play along all weekend :) Your card is fabulous - that die is just perfect and I love the sentiment too. Love the cards from the boys - they can have my washi tape, I'm not using it! Gorgeous card! And yes the pillows definitely need turning - Hammy was right. Love the boys two cards as well! I love that beautiful die you used for the mums. Your card is wonderful! And, mums are a favorite autumn flower of mine. I always tried to grow them and hoped they would survive the winters here and come back in the spring but was never successful. But for years I persisted in trying. Now it is easier to do them on paper and it can be done any time of the year. Honored to have you joined us at The Card Concept Challenge! This is absolutely stunning and a fantastic take on the challenge. Very pretty and I love the layered stitched rectangles. BEAUTIFUL card, Darnell! I love it! Thank you for the links to the challenges, too. I always take a look and jump in to join some of them, too. What a fabulous card, great interpretation of the inspiration photo, and a perfect example of CAS style. I would like to see the pillows flipped over too. Super neat card, Darnell--love it! Looks like the twinks had fun! I might have a challenge list to rival yours. When the pile of printed challenges starts interfering with my paper trimmer's ability to close, I toss the bottom inch or two of the pile. Yes, it's that bad. I love your card - it's a perfect interpretation (in my opinion) of the inspiration photo, and yes, those pillows should be flipped over. This is just stunning Darnell - perfect cas and a certain winner in my book! I agree with you about the pillows and the single side table would have to be on my side of the bed until we could get another. But then John would bring in any old junk to be on his side and spoil the look so on second thoughts I'd better let him have the nice one. Oh I love your card...it is phenomenal. Hope about that? :) And...when I read your posts, I feel like I'm sitting in the room with you having a conversation, laughing my head off. Oh how I appreciate you Darnell. Another great post, Darnell! I'm serious...you make my day every, single time I read your blog!!! This is one GORGEOUS card! I love how you placed the blossoms and the font on the sentiment is just beautiful! Love it to pieces! Two quick things: YES, they need to flip the pillows and add a nightstand on the other side of the bed...lack of balance drives me insane! But, it really is a stunning photo! And...Those grandsons of yours are so sweet! I love how they sign their names, too...from: Henry and from: Adam ~ too CUTE!!! What a gorgeous Sunshiny card Darnell, its Beautiful! and talking of Sunshine, you certainly Brighten our days...well so to speak! as its almost midnight here...lol Love your new Melding! and Yes I agree Hammy...flip those pillows!!! Great, smashing, super and spot on for the challenge. Sunshine on a card. The first thing I thought when I looked at the pic was " I don't like how they've done those pillows" so I'm on the same wavelength as you and Hammy. . . . . . . I'm checking into rehab first thing! Oh my goodness this is brilliant. I love the open work of those die cuts. So light and airy and an all around fabulous take on the inspiration photo! Those nested stitched die backgrounds make a lovely base for your beautiful flowers and sentiment. Ooo, how could I forget to mention the other two little beauties, and their cards are beauties too! I LOVE your card Darnell!! Those flowers are so fabulous-I might have to buy some for myself! Really like the white space and you are totally right about that sentiment. FABULOUS!! I saw this challenge this weekend but never got around to it because I was too busy using "the mess on my desk" to try to get it cleaned up. I vowed I had to use it up before I could play with my new stuff!! Darnell, you dropped everything to whip up this sweet card! You have really made a clean and totally fresh beauty for The Card Concept. The gallery is made more beautiful and we appreciate it! Now my head is leaning too! Love your take on the inspiration pic! Those flowers are gorgeoshus, Darnell, and I love the sentiment font, too. I have to keep going back to look at the card with all it's loveliness. Yay! for the boys are their creative talent. That flower die is perfect! Lovely, layered flowers and fun sentiment make for a great design. Hope everyone is feeling better. Frankly, my dear, this card is genuinely gorgeous and so inspiring!! Love the way you nailed the photo - Bet it is a winner!! You just made something truly marvelous so who cares about the potatoes boiling on the stove!! And the sweet cards from the littles - so precious and so sweet!! I have a few drawings that my girlies have sent me that have a prominent place on my magnet wall in my kitchen!! Lucky you to be so loved by them and so many, many more!!! Your grandson's cards are so cute. Your card is totally gorgeous. I love that NBUS die of the mum. So delicate! Have a great day Darnell! Hi Darnell, just wanted to say that this card is GORGEOUS!!! The colour is yummy and I love those die cut blooms. I'm right with you by the way on how they've made the bed ...... those pillows need a good flippin'! The kids did well with theirs. It really annoys me when you get patterned pillowcases, but they all go the same way. It doesn't look right on the bed. The pillows definitely need a flip but the inspiration is wonderful and your card is fabulous! Love, LOVE that sentiment and your gorgeous flowers, this card really has the WOW factor! Your card is stunning!! Oh I love that green and I'm sure I see a winner ... Beautiful cards from the boys ... Awww! Wow Darnell - this is truly fabulous! It always amazes me, and I'm sure I say it often, how perfectly you manage to echo a photo inspiration right down to colours, shapes etc. etc. Hope Mr K is feeling better - love the boys' cards! Love the sweet cards the boys made, bet they made Papa feel better!! And you my sweet friend have simply knocked my socks off. This is ONE GORGEOUS card ~ SWOON!!! My fave from you ever, hands down, seriously LOVE THIS!!! I love how your card is simply elegant. I do love the colour you used! Also love that memory box die! Great die cuts and clever card. Hope the mister is on the mend and how sweet the boys made you cards. Oh, Darnell, I can just imagine what a great time your friends and family must have with you around!! Smiles and laughter all the way!!! I just love your great sense of humour and I always leave here with a great big smile on my face!! ...and yes I do agree with you and Hammy on the unbalanced room!! ...and I do love your beautiful card!! Those flowers are so pretty and I love the 'stitching' round the edges. Lovely sentiment!! I think this card is one of my favs from you!! I just adore your gorgeous card! Those embellies are perfect on there! Truly awesome take on the inspiration picture! 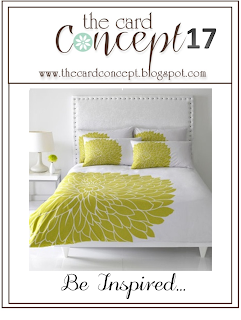 Love this challenge card and yes, I'd flip one of the pillows to center them. Patti is from "What are you inking". And you have such sweet boys! Hope K is feeling better. Amazing card Darnell, it's fantastic, and I would also like the flip the pillows. Such a stunning card Darnell, your sentiment font is fabulous. Cute cards from the boys as well - looks like you have some competition in the making. What a wonderful combination! Thanks for linking up to The Cutting Edge Challenge! Gorgeous card. Don't have a problem with the pillows but that duvet is driving me nuts faling off the edge of the bed. I did try straightening it up for you! Ahem. Do you know who your latest follower but one is? Lets see how your sleuthing does. I love the cards the boys made, makes me smile as the girls come over and do the same thing :-) Your CAS card is surely a winner!!! Beautiful card - I love the centre of the blooms - so pretty. This card is just totally awesome, Darnell!!! I love everything about it. Who has 76 comments on one card? Darnell of course! Just had to add my 2 cents, cuz it's gorgeous. Love the layered yumminess, and oh that sentiment! Yes must track that one down. Happy Moftering to you! Stunning flower...and I nearly reached out to touch it, with all that layer-y texture! I'm with you on the bedroom decor...flip the pillows, add another nightstand and I'm ready for a cozy sleep in a most gorgeous, balanced room! Actually, if the blankets on my bed are even a smidge askew, I get vertigo-ish. Yes...OCD! Straight blankets = happy me! Your twins cards: spirit-lifting guaranteed! Can see why the challenge appealed! And yes, I want to flip the pillow too! beautiful card, looks so fresh and happy! You nailed this inspiration photo! I love the die cut and the little embellishments. I think that's great that the twins want to make cards too. I hope hubbys back is much better now. You'll already know you have lots of things I love on this super card: Stitched dies, MB dies. I like the way you put 'em all together to make a real pretty card. Thanks for sharing the Twinks' cards. They are delightful. Easy to see the craft gene has been handed down. I bet you all had so much fun crafting together. Hope Papa is feeling better, and these cards had to have cheered him up immensely. TFS & Big Hugs. I love those fabulous flowers! Oh, happy day to you, Darnell! You just made my morning as I imagined you and Hammy cocking your heads to view the photo!! LOVE your take--absolutely gorgeous! The flowers and that awesome sentiment are perfect! I am sooooo flad you didn't miss the deadline, this CAL card is awesome! Thanks for joining us at the Card Concept! Simply stunning my sweet friend! I love those flowers and the centers are amazing, just amazing. Sorry to hear that Mister's back is out, hope he is on the mend. Take care! Thank you so much for playing along with us at The Card Concept. Your inspiration card is amazing. Love those flowers and the very positive feel to it. You captured that inspiration picture so beautifully! Wow! Fun cards made by the boys too - super sweet and glad you included them. Hugz! This is really beautiful card...and a fantastic job with the challenge!